The “Bake Off” results are in! 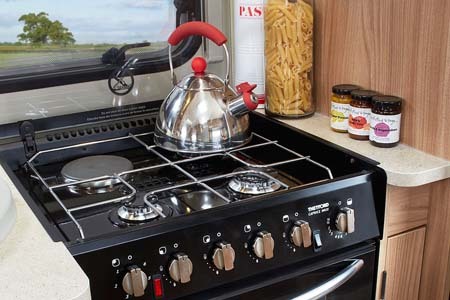 Last month we asked you to get into the spirit of the Great British Bake Off and tell us what you like to cook or bake when away from home in your static caravan or holiday lodge. October’s poll asked voters “What do you bake in yours?” to see if we could find some budding cooks amongst you. We received 70 votes and a couple of tasty dishes thrown in for good measure. Before unveiling the “Bake Off” results, let’s take a look at some of your comments. David Bean said his best cooked meal was a Sunday roast. Mary was more of a slow cooker fan and revealed her favourite mains and puds. “Spaghetti bolognaise in slow cooker, also rice pudding in slow cooker, as you can prepare in the morning before you go out and the meal is ready when you come back in,” she commented. The stand out winner was the Great British fry up with 32% of the votes! Coming in second was the healthier option of stew with 19% of you choosing this as your favourite dish. This was followed closely by a BBQ cook up with a 16% share of the votes and cooking in your caravan or lodge is clearly not for everyone, with 10% of you opting for going out! Well what better way to relax and get away from it all…? 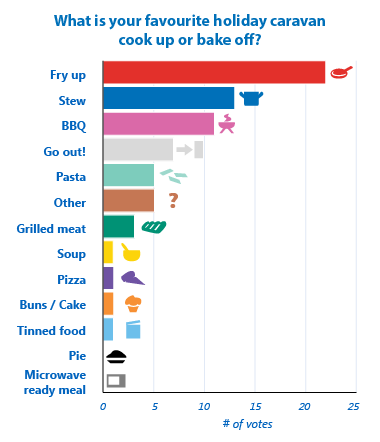 Nobody seemed to fancy a British pie or microwave meal but a few of you voted for pasta (7% of votes) and grilled meat got a small 4% share, followed by pizza, soup, cake and tinned food with just 1% of the votes each. Click here to take a look at all the comments in full. We’ll have a new poll on our blog for you to get involved with soon!